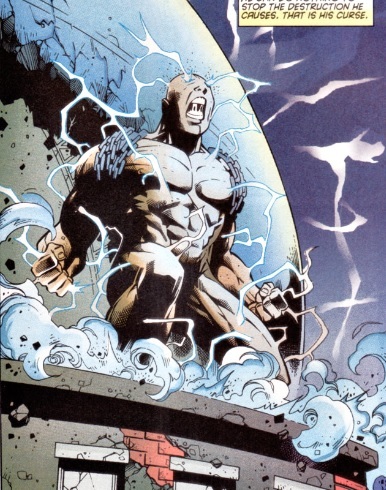 Powers/Abilities: The Armageddon Man possessed the mutant ability to tap into Earth's lines of power themselves, uncontrollably attracting natural disasters and destructive weather phenomena such as earthquakes, tornadoes, blizzards and even tidal waves. Over time, the Armageddon Man's powers increased geometrically, attracting more and more disasters to his location, and as his powers grew, he also grew in stature. As long as he was grounded, the Armageddon Man was completely invulnerable. History: (X-Force I#89 (fb) - BTS) - The boy who would become the Armageddon Man was born as one of the world's earliest mutants due to his parents' exposure to radioactive elements. (X-Force I#90 (fb) - BTS) - The boy's life was shattered when his mutant powers manifested. 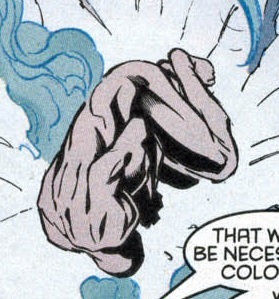 (X-Force I#88 (fb) - BTS) - The boy was ultimately taken into the Alamagordo Project, a government project studying the long-term effect of nuclear radiation on human biology headed by scientists who thought the nuclear age would forever alter humanity. (X-Force I#89 (fb)) - In 1959, the still-young Armageddon Man accidentally destroyed the entire town of 212 in Magic Mirror, New Mexico with an earthquake when he lost control of his cataclysmic powers. (X-Force I#90 (fb) - BTS) - Military researchers labeled the Armageddon Man's capacity for mass destruction as limitless. (X-Force I#89 (fb) - BTS) - Prompted by the military research, Col. Owen Danville ordered an airstrike on the Armageddon Man, which only stunned the mutant. (X-Force I#89 (fb)) - Six hours later, Danville and two Alamagordo Project scientists, Dr. Wheeler and Dr. Woolsey, visited the ruins of Magic Mirror, where they found the stunned Armageddon Man floating in mid-air. When Col. Danville asked if he had to nuke the Armageddon Man to put him down for the count, Dr. Woolsey informed Col. Danville that they had devised a special containment unit that would keep the Armageddon Man drugged and docile indefinitely. 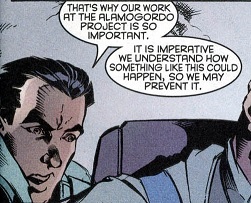 Danville replied that he hoped the Alamagordo Project knew what they were doing, as the Armageddon Man getting loose was a frightening thought, reminding them that an even more frightening thought was the possibility of the existence of more mutants like the Armageddon Man. 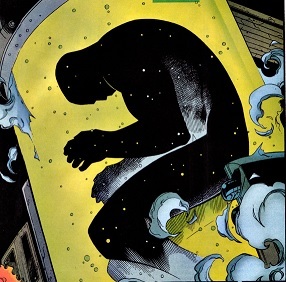 (X-Force I#88 (fb) - BTS) - Deemed too dangerous, the Armageddon Man was placed in suspended animation within the Alamagordo Project's containment unit. (X-Force I#89 (fb) - BTS) - When the Alamagordo Project was shut down following the deaths of Kurt Marko and Brian Xavier, the Armageddon Man's inert body was secretly sent to a Utah missile silo. (X-Force I#90 (fb) - BTS) - The Armageddon Man remained in his metabolic suspension chamber, completely unaware of the rapidly changing world around him. (X-Force I#89 (fb) - BTS) - Over forty years later, the mutant King Bedlam, leader of the New Hellions, learned of the Armageddon Man's existence from a disgruntled US Army intelligence officer and began plotting to place the Armageddon Man under his control in an effort to prove his power to the world. King Bedlam soon learned from an ex-CIA operative where the Armageddon Man was being kept. (X-Force I#88 (fb) - BTS) - Three years after learning of the Armageddon Man's existence, King Bedlam broke into the Utah missile silo containing the Armageddon Man and liberated him, taking the still-in-stasis mutant to his vineyard headquarters in Santa Lucia. (X-Force I#90 (fb) - BTS) - King Bedlam's ally and teammate, Tarot, read the military files on the Armageddon Man, learning that the Armageddon Man's power taps into the Earth itself and that as long as the Armageddon Man was grounded, he could not be defeated. (X-Force I#88) - After King Bedlam reunited with his younger brother, X-Force's Bedlam, he showed his brother the Armageddon Man, still in stasis, explaining that the Armageddon Man had power enough to level mountains. When Bedlam asked King Bedlam what his plans with the Armageddon Man were, King Bedlam explained that the Armageddon Man would prove that his New Hellions were a force to be reckoned with. 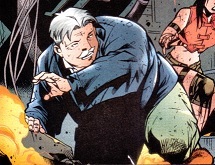 King Bedlam then suggested that his younger brother might have to decide to join the New Hellions or stay with X-Force if X-Force opted to stop King Bedlam's plans, promising that nothing would separate the Bedlam Brothers again. When X-Force learned that Domino's body was being controlled by the New Hellions, they deduced that King Bedlam was up to no good and confronted King Bedlam, who unleashed the rest of his New Hellions against the heroic mutants. The New Hellion Paradigm made short work of X-Force before King Bedlam led his younger brother and the rest of the New Hellions into the room containing the sleeping Armageddon Man. As the New Hellions looked at the Armageddon Man, King Bedlam announced his plans to bring the Armageddon Man to the Summerfield Canyon Nuclear Power Facility, where the Armageddon Man would be woke up and used as a weapon by the New Hellions to bring the world to its knees. (X-Force I#89) - Under the control of the New Hellion Paradigm, X-Force helped the New Hellions cart the still-sleeping Armageddon Man to the Summerfield Canyon Nuclear Power Facility in hopes of resurrecting the mutant. Watching the proceedings from inside the facility, X-Force's Bedlam had doubts about his alliance with his older brother King Bedlam. When King Bedlam revealed that he had been planning for three years, Bedlam questioned whether the Armageddon Man's agenda would line up with King Bedlam's but King Bedlam insisted he could be quite persuasive when necessary. Magma soon revealed that she merely wanted money for aiding King Bedlam, who revealed that with the Armageddon Man, he had the means to obtain all of the power and money that he wished. Bedlam continued questioning and King Bedlam explained that he had sent Feral and Switch out to ensure that the New Hellions would be taken seriously before he further explained that they had moved to the Nuclear Power Facility because the Armageddon Man would use a great deal of energy to awake from his slumber. Once X-Force had gotten the Armageddon Man into position, the New Hellion Switch arrived in the body of now-Senator Owen Danville, having kidnapped him in front of his dog Tasha after killing Danville's bodyguard Fenwick, to force Danville to bear witness to the restoration of the Armageddon Man. Upon hearing that King Bedlam planned to revive the Armageddon Man, Sen. Danville exclaimed that King Bedlam must be crazy to unleash the Armageddon Man but King Bedlam only reminded Danville about the blood on his own hands and explained that Danville was present because he knew exactly what was at stake if the Armageddon Man was unleashed. When King Bedlam then used the Armageddon Man to blackmail Sen. Danville into forcing Washington to meet the New Hellions' demands, Sen. Danville angrily agreed to call Washington. Shortly after, Sen. Danville attempted to convince Feral of the error of the New Hellions' ways, insisting that the Armageddon Man's mutant ability to attract natural disasters would destroy hundreds of thousands of lives but when Feral, along with Magma and Switch, appeared uncaring, Sen. Danville accused them all of being mad. While the New Hellions argued with Sen. Danville, King Bedlam caught his brother Bedlam attempting to hotwire a car and flee and when King Bedlam confronted Bedlam, Bedlam admitted that the Armageddon Man's revival was way of out of his league before King Bedlam decided to let his brother be. X-Force was soon freed when Tarot introduced her tarot images into Paradigm's programming, causing him to regress, and Tarot admitted her betrayal to King Bedlam, revealing that her future predictions had shown that the Armageddon Man's revival would bring only misfortune. During King Bedlam's argument with Tarot, his younger brother Bedlam turned against him as well just as the newly-freed X-Force stormed the area. The battle was quickly interrupted, however, when the waking Armageddon Man's powers attracted an earthquake that destroyed the Armageddon Man's containment unit, freeing the revived Armageddon Man. (X-Force I#90) - The Armageddon Man's revival generated a slew of disastrous weather such as flash floods and tornadoes. A short ways away from the Nuclear Power Facility, the fleeing Bedlam stopped for gas and the area was hit by an earthquake caused by the Armageddon Man's revival. Screaming as he reawakened, the Armageddon Man's powers immediately began building as he became aware that he now held the power to destroy the world that had been denied him. Inside the Summerfield Canyon Nuclear Power Facility, King Bedlam gloated that the weather patterns would only increase if his demands were not met. Sen. Danville quickly asked why King Bedlam could not wait until Washington responded to his earlier phone call but King Bedlam replied that the government needed an demonstration of what would happen if they didn't agree to his demands. A panicked Danville tried to exclaim that the Armageddon Man couldn't be controlled but King Bedlam knocked Danville aside and revealed a Psionic-Amplifier, which King Bedlam planned to use to telepathically command the Armageddon Man. Donning the Psionic-Amplifier, King Bedlam demonstrated how he could paralyze the Armageddon Man with confusion to manipulate his actions and suggested Sen. Danville phone the President to have money transferred to his off-shore accounts. Quietly deciding to focus their attack on King Bedlam, X-Force discussed their plans but Cannonball, thinking they needed a distraction, announced his attack on the Armageddon Man and flew towards the confused mutant despite Siryn's orders not to. Content to let Cannonball injure himself against the nigh-invulnerable Armageddon Man, King Bedlam watched as Cannonball cracked a rib when the Armageddon Man backhanded him away. King Bedlam soon turned his attention towards the attacking X-Force but King Bedlam's Psionic-Amplifier was fried by his returning younger brother Bedlam, removing King Bedlam's control over the Armageddon Man. As the battle raged inside the Nuclear Power Facility, the Armageddon Man's powers controlled to grow out of control, causing fifty-foot tidal waves to hit San Francisco, California and lightning storms to ignite the forests of the Pacific Northwest United States. Armageddon Man soon caused earthquakes to rock the Nuclear Power Facility as Bedlam battled King Bedlam, with Bedlam learning about his older brother's role in their parents' death. 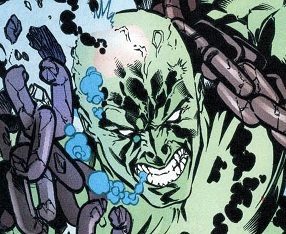 The enraged Bedlam refused to kill King Bedlam for his crimes, however, instead threatening King Bedlam to use his knowledge of the Armageddon Man to help take the uncontrolled mutant down. When King Bedlam refused to help, X-Force's Danielle Moonstar questioned Sen. Danville about how to stop the Armageddon Man but Sen. Danville proved unable any helpful information. The New Hellions' Tarot instead revealed that the Armageddon Man was invulnerable as long as he was grounded before King Bedlam, angry at Tarot's betrayal, ordered his New Hellions to retreat. Realizing that the Armageddon Man's earthquakes would soon destroy the Nuclear Power Facility, causing a nuclear disaster, X-Force opted to focus on the Armageddon Man as the New Hellions escaped. As X-Force worked with reluctant New Hellion Magma to create a barrier to prevent a nuclear catastrophe, the Armageddon Man grew to gigantic height as his powers continued to increase. While he grew, the Armageddon Man's memories of his life prior to his mutant powers manifesting began to fade as his powers transformed him. Sensing the Armageddon Man's confusion, Danielle Moonstar explained to the rest of X-Force that the Armageddon Man's powers were building towards a critical mass that threatened to tear the Armageddon Man apart. Acting quickly, Moonstar had Cannonball fly her close to the Armageddon Man, where she used her quantum powers to distract the Armageddon Man while Meltdown used her time bombs to knock the Armageddon Man off-balance. Warpath then got underneath the Armageddon Man and hurled the Armageddon Man into the air, effectively breaking off his connection with the Earth. Cannonball then flew into the air and collided with the falling Armageddon Man, knocking the Armageddon Man unconscious and ending the natural disasters his powers had caused. Domino then brought carbon rods to the scene, which Warpath used to wrap the Armageddon Man, absorbing the mutant's excess radiation. Sen. Danville then suggested calling in some favors to get the Armageddon Man put back into suspended animation but Warpath argued that the Armageddon Man deserved to be somewhere he could be cured rather than be put into cold storage for another forty years. When Moonstar suggested finding a truck to cart the Armageddon Man away, Sen. Danville argued that X-Force did not have the facilities to proper handle the Armageddon Man and Domino agreed. Ultimately, X-Force and Sen. Danville came to an agreement, with Danville giving his word that the Armageddon Man would get the best possible care in exchange for X-Force keeping quiet about the Armageddon Man's existence. As X-Force departed, Domino promised that they would be watching what Danville did with the Armageddon Man and if they didn't like it, they would return. Comments: Created by John Francis Moore, Jim Cheung, Mark Morales and Rod Stull. So as to not sound TOO confusing, anytime I refer to only "Bedlam" in this profile, I am referring to Jesse Aaronson. Christopher Aaronson will only be referred to as "King Bedlam." Davy Crockett, Mickey Mantle, That'll Be the Day, Gene Autry, Leave it to Beaver, yo-yos, his mother, J. Fred Muggs, Eisenhower, Sputnik, Irish McCalla, Gunsmoke, sick sick sick, and Father Knows Best. These memories were likely just flashes of things the Armageddon Man remembered from his youth but any specific connection to any of these memories remains unrevealed. In 1959, Colonel Owen Danville was a US Army officer assigned to the secret Alamagordo Project. When a boy that the Project was researching accidentally destroyed the entire town of Magic Mirror, New Mexico, Col. Danville, having read the military's research file on the boy, ordered a military airstrike on the boy, which succeeded only in stunning the boy. Six hours later, Col. Danville visited the site with two of Alamagordo's scientists, who assured Danville that they had devised a containment unit to house the boy. 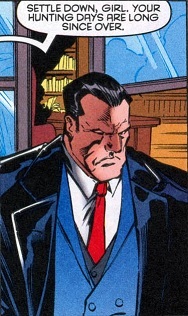 Fearing the rise of mutants, Col. Danville eventually became a US Senator, where he became part of a subcomittee that ultimately authorized the anti-mutant Operation: Zero Tolerance program. Months later, Senator Danville was interrupted at his home when his dog Tasha heard a noise outside. Danville sent his bodyguard Fenwick to investigate but when Fenwick didn't immediately return, Danville grabbed some guns and went outside, where he found Fenwick dead. Moments later, Danville was attacked by the New Hellions member Switch, who took over the body of Danville, placing Danville's consciousness into Switch's body. Switch then took Sen. Danville to the Summerfield Canyon Nuclear Power Facility, where Danville was to bear witness to the New Hellions' revival of the uncontrollable young mutant Danville had witnessed back in 1959. Despite Danville's insistence that the now-adult mutant, dubbed the Armageddon Man, was uncontrollable and would wreck disaster onto the country, New Hellions leader King Bedlam blackmailed Sen. Danville into calling Washington to agree to King Bedlam's demands. Heroic mutant group X-Force eventually confronted the New Hellions and Danville witnessed their battle against Kind Bedlam and the New Hellions, thinking all present to be mad. Following the New Hellions' escape and the Armageddon Man's defeat at the hands of X-Force, Danville was shocked to see X-Force handle the Armageddon Man with minimal casualties, but insisted that the group was not capable of handling the Armageddon Man should he reawaken. Danville and X-Force soon came to an agreement, with Sen. Danville promising that the mistreated Armageddon Man would get the best care available if X-Force remained quiet about the Armageddon Man's existence. Sen. Owen Danville did not have superhuman powers but in his heyday, he was a skilled US Army officer. As he aged, he suffered from arthritis that made his hands somewhat shaky, making it difficult to hold a gun. Fenwick was the bodyguard to Senator Owen Danville. When Danville's dog Tasha heard a noise outside, Danville asked Fenwick to check on things and Fenwick assured Danville he would take care of it. Unfortunately for Fenwick, when he ventured outside, he was brutally killed by the mutant Feral. When Fenwick did not return, Danville decided to investigate and soon found Fenwick's corpse outside. Tasha was Senator Owen Danville's faithful dog. In her younger days, she would accompany Sen. Danville on hunting trips but as she aged, she remained a companion of Danville's and resided in his home. One night, Tasha sensed something outside and began to bark. Thinking Tasha had only sensed a raccoon, Danville sent his bodyguard Fenwick outside to investigate. Dr. Wheeler was a scientist working for the top-secret government Alamagordo Project circa 1959, which researched the effects of radiation on human biology. After a young boy (later the Armageddon Man) accidentally killed the entire town of Magic Mirror, New Mexico, Dr. Wheeler accompanied fellow scientist Dr. Woolsey to investigate the scene alongside Col. Owen Danville. Once there, Dr. Wheeler revealed that Col. Danville's airstrike on the young mutant had only stunned him. Dr. Woolsey was an Alamagordo Project government scientist circa 1959, when a young mutant accidentally destroyed the entire town of Magic Mirror, New Mexico with his uncontrolled powers. When Dr. Woolsey and Dr. Wheeler met Col. Owen Danville at the scene six hours later, Dr. Woolsey assured Col. Danville that their work at the Alamagordo Project was very important if more mutants were to manifest, remarking that they had to understand mutants if they were to prevent events such as Magic Mirror's. Danville admitted he only wanted to know if the young mutant was dead or not and upon learning that the mutant was only stunned, Danville questioned whether nukes would be needed. Dr. Woolsey assured Danville that they had designed a containment unit for the young mutant in order to study him and Danville only replied that the only thing that frightened him more than the young mutant escaping was that there could be more like him out in the world.